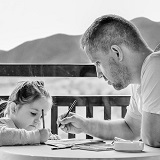 Research indicates that children raised by this style of parenting have greater academic achievements, suffer from fewer symptoms of depression, and exhibit fewer signs of aggression, disobedience, and other such antisocial behaviors. By being an authoritative parent, you will help your child commit to and fulfill adult social roles. These adult social roles are the foundation of a healthy life. Understand what an adult social role is. All adult social roles have one thing in common: they require you to have responsibilities and obligations beyond your personal care and pleasure. Examples of adult social roles include being a parent and having a job. Be an authoritative parent by finding the line between overly strict and overly indulgent. Enforce rules, but explain the reason behind them. Don’t let your children get away with doing things they are not supposed to be doing, but treat them with respect and remain emotionally warm toward them.